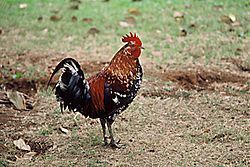 Junglefowl are the four living species of bird from the genus Gallus in the pheasant family, which occur in India, Sri Lanka and Southeast Asia. These are large birds, with colourful male plumage, but are nevertheless difficult to see in the dense vegetation they inhabit. The junglefowl are seed-eaters, but insects are also taken, particularly by the young birds. One of the species in this genus, the Red Junglefowl, is of historical importance as the likely ancestor of the domesticated chicken. Junglefowl Facts for Kids. Kiddle Encyclopedia.